We will be doing detailed coverage of today's announcements on TechzTalk. Join us there for more information. Looks like there will be no One More Thing today. And he will be singing few songs. Before we close, I'd like to return to music." Elvis Costello is on stage. Tim says "I's like to thank all the teams at Apple that worked so hard at creating these products." iPhone Ad videos - first its iPhone 5C. Tim is back on stage. Says that's iPhone, we don't just pack in feature after feature. "we thick deeply about experience we want to create." Preorders start on September 13th and the phones will launch on September 20th. So now the iPhone lineup will have iPhone 4S for free, iPhone 5C for $99 and $199 and iPhone 5S for $199, $299 and $399. iPhone 5S will come with 16GB for $199, 32GB for $299 and 64GB for $399. Phil says the finger print scan is never available to other software and is never uploaded to Apple's servers or backup on the iCloud. Jony's video talking about the design of the new finger print sensor. Phil says "You can simply touch your home button to unlock your phone." The Home button has the Touch ID sensor, which is covered by a sapphire lens. The Touch ID Sensor is 170 microns thin, senses 500 pip and scans sub-epidermal skin layer. Phil says "The most common way is to set up a passcode. Unfortunately, some people find that's too cumbersome." So Apple has developed Touch ID that uses a key which you haveeverywhere you go. Your Fingerprint. The third feature on iPhone 5S is security. Phil is now showing some untouched photos and videos taken by iPhone 5S. It also has Slo-Mo mode that takes 120fps video at 720p. There is also a new burst mode that takes 10 frames per second. The camera also has two LED flash that combines to give right color balance. It automatically takes multiple photos and selects that best one. The camera app sets white balance, exposure, autofocus automatically using data from 15 zones. The sensor has 15 percent larger active area with bigger pixels making better pictures. iOS 7 has be designed to take advantage of the new sensor. It also has a completely redesigned camera system featuring new five element lens with f2.2 aperture. The iPhone 5S will offer 10 hours of browsing and talk time. Nike is using this new API in their app Nike+ Move that integrates A7, M7, GPS and Nike Fuel Points. It measures accelerometer, compass and Gyroscope data along for a new CoreMotion API in iOS 7. Phil announces a new part M7 that works along side A7 processor, its a motion co-processor. Infinity Blade III demo time. He says that added performance benefits of OpenGL ES 3.0 are clearly shown in the games that Epic will release. Donald says that gaming performance on iPhone 5S is five times faster that iPhone 5. Epic Games' Donald Mustard is on stage to demo that performance gain. Phil says that compared to original iPhone, the iPhone 5S has 40X CPU performance and 56X graphics performance. The chip runs both 32-bit and 64-bit apps seamlessly and iOS 7 has been completely reengineered for 64-bit. Phil claims "World's first and only smartphone with 64-bit chip". Phil starts by talking about performance. It has 64-bit A7 chip. The first ever on a smartphone. It will come in Slate, Gold and Silver. Now its iPhone 5S. Phil says "It's perhaps the most forward thinking phone anyone has ever made." iPhone 5C has matching wallpapers for different colors. Apple is showing those Silicon cases again and again. They do look nice. iPhone 5C video time with Jony. iPhone 5C will come in 16GB for $99 and 32GB for $199. iPhone 5C will have 4-inch Retina display, A6 processor, 8-megapixel camera, FaceTime HD, LTE and Bluetooth 4.0. Apple has also created cases for the new iPhone 5C made with soft feel silicon rubber. Even though it's plastic the phone doesn't look cheap like some of the Nokia Lumia phones. iPhone 5C video time... It comes in lime green, white, blue, orange and yellow. Phil is on stage and he first announces iPhone 5C. He says that its made with the same incredible iPhone 5 technology, but will come in more fun colors. iPhone 5 has been the most successful iPhone. He shows a sales chart with rapidly rising curve. He says this year we are replacing the iPhone 5 with not one but two new designs. Tim says now I would like to talk about the iPhone. and iPhone stats are coming. So these Apps will be free with any new iOS device. Now its iMovie and iPhoto and Tim claims that "Almost all of our customers want these apps." Tim is back on stage and is talking about iWork now, calling iWork the best selling mobile productivity apps. iOS 7 will be out on Sept 18th. iOS 7 has more than 200 new features and developer community is hugely inspired. Shows few apps like Evenote, Zillow running on iOS 7. Oh... he is now showing iTunes Radio, which he calls "the best way to experience new music." He is going really fast, already in camera features. And now photos app and that was the rapid overview of iOS 7 that will also have AirDrop. iOS 7 will have more textured ringtones and system alert sounds have also been improved. He is playing a sample. He shows Multitasking, Safari and Siri. He is talking about some of the features of iOS 7 including Home Screen, Control Center and Notification Center. He is going of the features fast. And Craig Federighi is on stage to talk about iOS 7. Apple will ship 700 million iOS devices by next month. Tim talks about upcoming Stanford, CA store that will have new design offering two rooms - one for service and one for retail. Now Tim is talking about retail and how Apple is expanding its footprint outside the US. It was streamed live to 100+ countries. He is talking about iTunes Festival that was watched by 20 million people. Tim is on stage updating about recent stats. 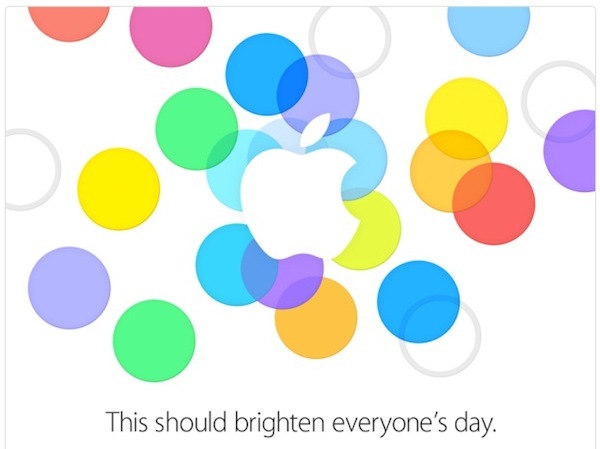 The Apple event is about to start. The hall is full and lights are going down. Will Apple announce the iWatch like we heard few minutes ago from our source. We are in the hall with music playing. 5 more mins to go. We are moving in the building. 15 more mins to go. We are doing live coverage of Apple’s iPhone media event at live.TechzTalk.com. It is rumored that Apple will announce the next gen iPhone 5S and completely new iPhone 5C, along with iOS 7 at today’s event. And just few moments ago we heard from our source that there would also be ‘One More Thing’ at today’s Apple Event. Continue following this page, as we will do live coverage here giving you the latest news from today's Apple event, which would start in about 40 mins.